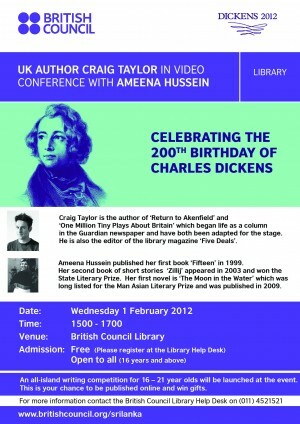 UK author Craig Taylor in video conference with Ameena Hussein share their thoughts about two cities: London and Colombo. Craig Taylor is the author of 'Return to Akenfield' and 'One Million Tiny Plays About Britain', which began life as a column in the Guardian newspaper and have both been adapted for the stage. He is also the editor of the literary magazine, Five Dials. His latest book is 'Londoners: The Days and Nights of London Now - As Told by Those Who Love It, Hate It, Live It, Left It and Long for It’. Hussein published her first book ‘Fifteen' in 1999. Her second book of short stories ‘Zillij’ appeared in 2003 and won the State Literary Prize. Her first novel is ‘The Moon in the Water’ which was long listed for the Man Asian Literary Prize and was published in 2009.